The TNC Annual General Meeting will be held in the Undercroft. The date will be advertised in the rust and navy newsletter. All positions are available as committee members stand down each year and get elected or re-elected for particular positions. If you have an interest in netball, big or small, we would welcome your support. Without volunteers, the Club would not run. If you would like further information about the many positions available and what is involved, please contact us at tangaranetballclub@hotmail.com . Everyone is welcome to attend the AGM. The Netball kit bag is distributed to the coaches at the coaches and manager's meeting at the beginning of the season and returned on Presentation Day. Please ensure that you check off the following list before handing it in. 4) Please see the equipment co-ordinator on presentation day, so that we can mark the kit bag as being received. Your assistance in these 5 steps is greatly appreciated. Hoops for Netta (U7s and U8s only) - These are picked up on the first day of competition from the BHSNA control room and are returned on Gala Day. Graded teams only - After round 14, if your team finishes in the top 4, you will go through to the semi finals. The top two teams on the ladder battle it out in semi final 1 and the winner goes directly into the grand final. The third and fourth teams on the ladder go into the elimination round with the winner playing against the loser of semi final 1 the following week and the loser being eliminated. The final consists of the loser of semi final 1 against the winner of semi final 2 with the winner of this game going through to the grand final the following week. The grand final is the winner of semi final 1 against the winner of the final. Teams are to provide a scorer, a timekeeper and a primary care person for each of these rounds. The club has fundraisers during the year. We raise money for new equipment, trophies etc. We rely on the generous contributions of our netball families to assist with our fundraising efforts and welcome your help on the day to assist with setting up and serving. The BHSNA Gala Day is a fun day for the Under 7s, 8s and 9s and is held on Saturday April 2. It is held at the Kellyville courts and includes the presentation of medals to all the players in the NetSetGO competition. All players are expected to attend. The Tangara Netball Club organises mini gala days held at the school during the netball season to help improve player's, coaches and umpire's skills. Our Gazebo is a great place to shelter from the weather, relax between games or as a nominated meeting place for the team. 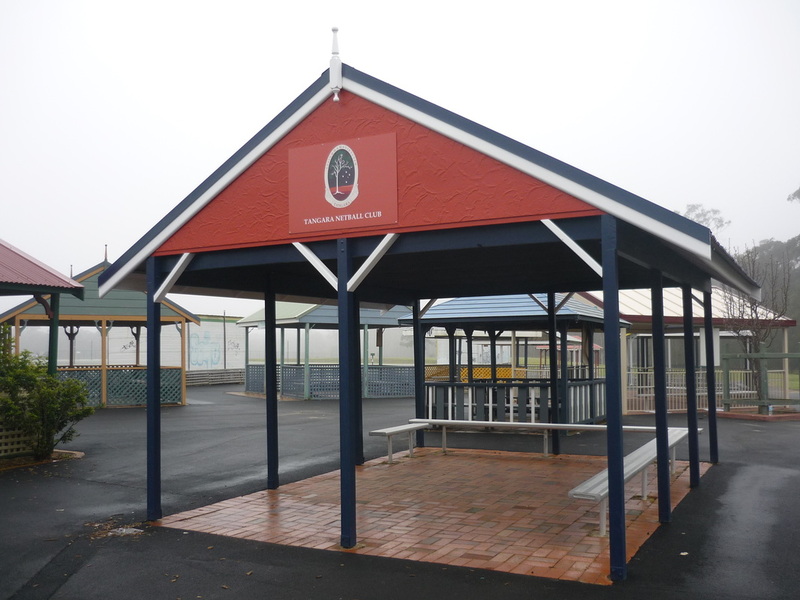 You can find it amongst the other gazebos at the kellyville complex, painted in the school colours. Grading is the process of establishing the composition of Tangara Netball Club teams to compete in the BHSNA competition. Grading is for teams from U10 onwards only. Decisions are made by an independent Grading Committee in conjunction with reports supplied by the previous season’s Coaches. Grading Day is important and we encourage all player’s to attend. The process takes approximately 1 hour and your patience and cooperation is appreciated. The dates will be emailed and advertised in the Rust & Navy. NetSetGO is an introductory program for netball. It has been developed to provide children aged from 5 to 10 years with the best possible introduction to the sport of netball. ​NetSetGO 5-7 year olds do not play in a competition but have an in-house training program held at school. For 2016, this is scheduled for Term 3, however, more details will be in the school newsletter later in the year. NetSetGO 8-10 year olds still play Saturday mornings at Kellyville. NB An under 7 team can be entered at Kellyville as well, provided we get the numbers. NetSetGO players – May NOT play in any competition matches. The school sports photos are taken during term 3. The date will be emailed and posted in the Rust and Navy. Players are asked to bring their full netball uniform that day for the photo. Players cannot be included in the photo without a uniform and the school does not allow the students to "borrow" uniforms from each other. The photos are available for purchase and are published in the Tangara Year Book. All coaches and managers are welcome to be part of the photos. The Netball Presentation Day is held at the end of the season, in the school undercroft. The date and time is printed on the school calendar and advertised in the Rust & Navy. All players are encouraged to attend and wearing netball uniforms is optional. Lunch is provided for all the players and everyone else is able to buy sausage sandwiches and drinks on the day. The Baulkham Hills Shire Netball Association (BHSNA) website is updated at 7am and the announcement appears under the "Wet Weather Notification" tab. If you have heard nothing from your team manager and the website doesn't show any announcements then prepare to play as Netball is rarely called off. The Courts at Kellyville are on Wellgate Avenue (just past Withers Road). Click here for directions.